Over the last few years I know I have tweaked and fiddled with my bike set-up to the point where I am no longer 100% confident it is correct set-up anymore. 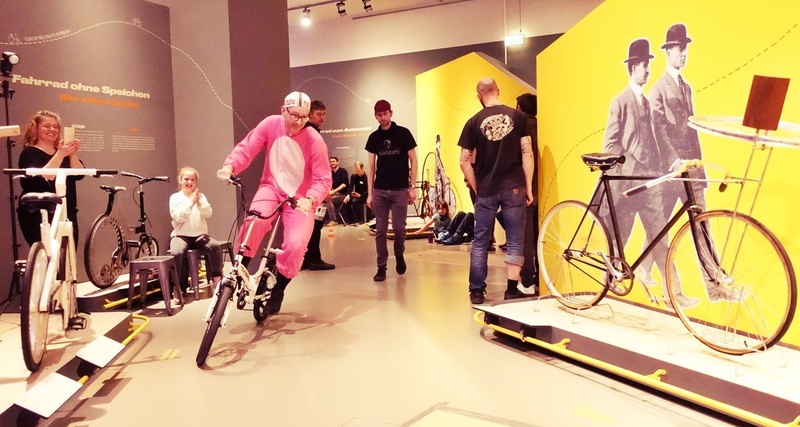 For this reason I wanted to get a professional bike-fit done. Some internet research led me to Aoyama-san at Sports Bikes HiRoad today. He is an ex-employee of Y's bikes in Akasaka, but branched out on his own 2 years ago, setting up his shop in Koyama 18 months ago. 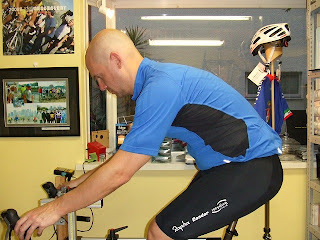 He provides professional bike-fitting analysis and advice using www.bikefitting.com. Firstly, he completely readjusted my Look cleat positions after measuring my feet and checking the exact position of the ball of my foot whilst wearing my cycling shoes. The result was to move the cleat forward and in. This in itself was probably worth the visit to his small store. 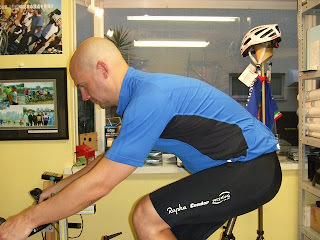 He conducted a short interview to learn a little about riding style, then did a set of very precise body measurements. 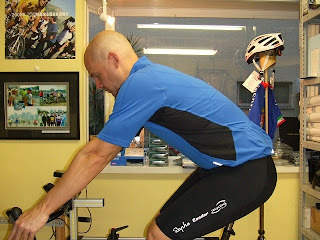 This data is sent to the database in Holland, after which it returns the optimal bike geometry measurements. He then sets this 'perfect' bike on his simulator. On the simulator you can try out the set-up. Aoyama-san uses his experience to talk you through cycling technique, lower body physiology and upper body position. He then 'tweaks' the simulator to try a few different positions, eg. lower bars, more forward, higher, etc. 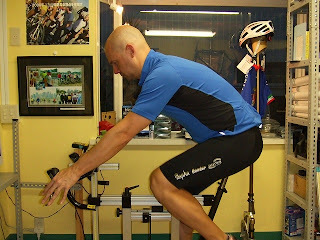 The www.bikefitting.com set-up. Gripping firmer. It is a bit too far and we revised it. Revision 1. Slightly easy. 0mm vertical and 20mm closer on horizontal slides. Revision 2. Slightly agressive. 20mm lower vertical and 10mm closer (10mm further than revision 1) on horizontal slides. Once comfortable he measures the rig and then produces a comprehensive pdf file for your reference and to adjust your bike to. The whole process took 3 hrs. 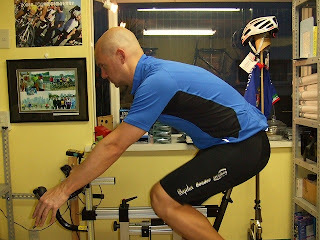 The outcome was to raise the saddle significantly (very surprised), move it backwards a touch and drop the bars. It feels great. Noticeably less weight in my hands and definitely a feeling of more power transfer and control. 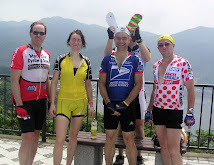 I am looking forward to my ride tomorrow! Very interesting. It seems that we have or had a similar "shoulder" style: I tend to be raise them high and they become very stiff and it is much more difficult to steer through sharp curves in this cramped style. Realizing that, I take the tension out of my shoulders out before manouevering a curve, but I fall back into the same position soon after. Any advise? How much does Aoyama-san charges about? Thanks, James, for introducing Aoyama-san. Sounds like a worthwhile service. MOB, the prices are at his website. As mentioned the prices are at the website, but he charged me Y21,000 for 3hrs fitting.